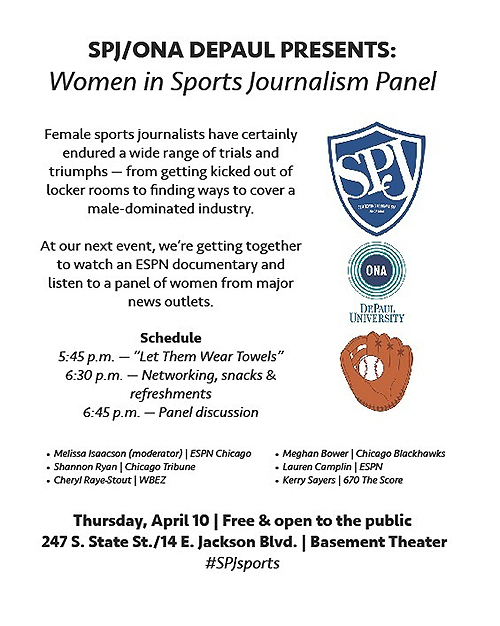 SPJ/ONA DePaul is hosting a Women in Sports Journalism Panel on Thursday, April 10. The event, which is free and open to the public, starts at 5:45 p.m. with a viewing of an ESPN documentary, “Let Them Wear Towels,” followed by networking and the panel. Guests can arrive at any point up to 6:45. Details of the panel are below. This event was made possible by a generous SPJ national programming grant.